When my home on an obscure street in small-town British Columbia made it to Google Street View last year, I realized it was only a matter of time until we would be “clicking” our way down the trails in the mountain parks. Sure enough, Parks Canada and Google Maps Street View have just announced virtual tours of various sites and trails across Canada. A number of trails are already online, which allows you to “hike” to a variety of natural wonders without leaving your office chair. The screen capture to the left is the Lake Louise Lakeshore Trail on Google Street View. The technology is an offshoot of the ubiquitous Google Street View vehicles that have been providing metre-by-metre, 360-degree coverage of most every highway, street, city and village in the western world. 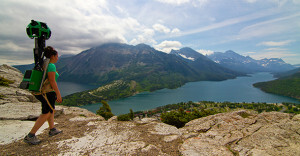 Now a scaled-down version of the original vehicle-mounted panoramic camera, the Trekker, has been attached to a backpack to photograph some of Parks Canada’s popular hiking trails. 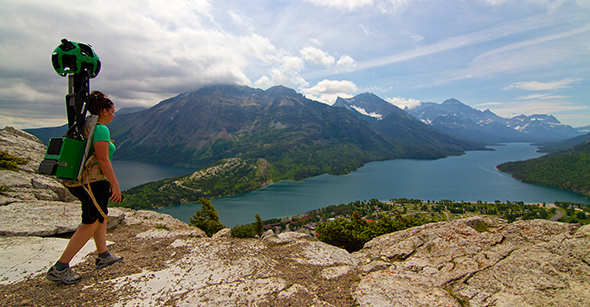 A hired hiker sports a Google Street View “Trekker” camera atop Waterton Park’s Bear’s Hump. Photo courtesy of Parks Canada. The cooperative project with Parks Canada appears to be the most ambitious use of the Trekker technology since it was launched on the Grand Canyon’s Bright Angel-South Kaibab trails in 2012-13. The task of photographing Canada’s mountain park trails began last summer and is scheduled to continue through next summer. At present, a number of short trails have been photographed throughout the mountain parks along with several historic sites across Canada. My own experience with Street View trails has been mixed. On the positive side, the Google Trekker seems to have encountered fewer people on these popular trails than I usually do (just a few blurred-out faces peering at the strange, orb-shaped camera as it passes by). However, I’m sure I could literally hike Johnston Canyon faster than I did virtually on Street View (maybe that’s because I’m a clumsy clicker or my computer is slow to focus on the next stretch of trail). I also found that flat, open trails work better than steep, switchbacking ones (Tunnel Mountain drove me crazy). And you should follow the same rules for Street View hiking as we suggest for the real thing—stop frequently and use the 360-degree pan feature to take in your surroundings. Parks Canada also has a site devoted to these new Street View trails, and you can use their map to access all the posted routes as well as new ones as they are added next year. Explore Canada’s natural and historic treasures with Street View… In addition to Lake Louise lakeshore (see link above), Banff’s Johnston Canyon and Yoho’s Emerald Lake work fairly well. Meanwhile, it will be interesting to see where Parks Canada and Google Street View go with their cameras next summer. I see this undated post by Brian.